Long lines formed at Texas gas stations Thursday as some prices started to spike — but officials say Hurricane Harvey hasn't led to a shortage of fuel. DALLAS — As drivers clogged major city streets snaking into gas stations on a sunny day hundreds of miles from parts of the state swamped in catastrophe, Texas officials on Thursday scurried to fend off what they characterized as undue panic over a fuel shortage that doesn't exist. Texas Railroad Commissioner Ryan Sitton said in an interview with The Texas Tribune that the issue was not about supply, but logistics. Yet that came hours after thousands of Dallas-Fort Worth residents began rushing to gas stations to fuel up ahead of Labor Day weekend amid news reports that convenience stores could run out "because of supply disruptions caused by Hurricane Harvey." 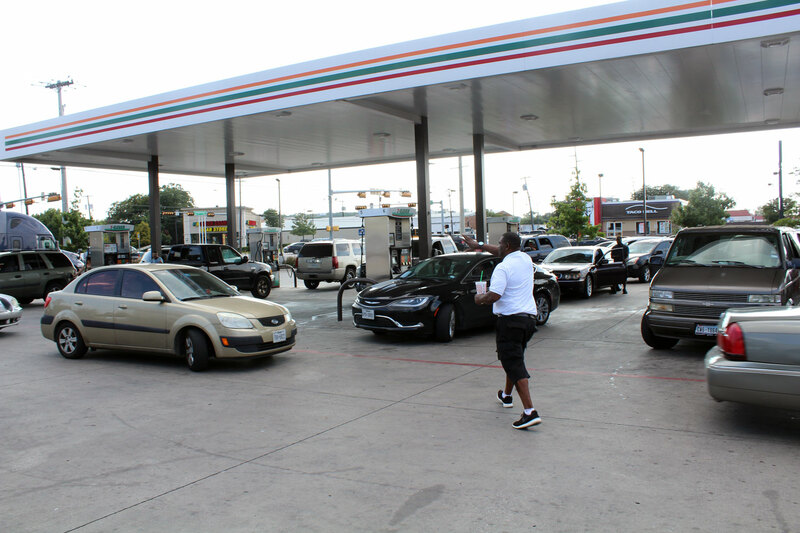 Meanwhile, and despite officials' like Sitton saying a fuel shortage didn't exist, gas prices rose dramatically and lines snaked around Dallas-area stations Thursday afternoon. State Rep. Drew Springer, a Republican from Muenster, tweeted a picture at a Fort Worth pump where around 18.5 gallons of gas cost nearly $125. Rafael Sepulveda of Garland heard a TV report about long lines and a potential outage. Instead of going home after work, he drove around Dallas trying to find a station that still had fuel left. Many in the area were tapped dry during the daytime onslaught of worried motorists. "We've been driving for an hour looking for gas," he said outside a West Dallas 7-Eleven. There, like in many spots across the region, cars sat in long lines that stretched from gas pumps into city streets. The situation worsened during rush hour. As Sepulveda waited in line, two convenience store employees tried to keep order around the pumps as cars sprawled out in every direction and drivers waited to top off their tanks. Texas has around 15 oil refineries that are currently out of production thanks to Hurricane Harvey. Sitton said that the U.S. had about 230 million barrels of gas in storage and that it's just a matter of time and redirecting supplies to North Texas. Sitton advised people to wait and fill up, if their tanks could afford to wait three or four days. "People are hearing of concerns, and they’re texting each other, ‘Oh my gosh, you gotta go get gas right now,'" Sitton said. "There is not a gas shortage in the U.S."
Gasoline prices continued to rise across the U.S. on Thursday as downed refineries strained supplies along the Gulf and Atlantic Coasts, according to S&P Global Platts. Prices on the New York Mercantile Exchange leaped to nearly $2.14 per gallon, up more than 50 cents from Aug. 22, before refineries shuttered in anticipation for Harvey’s winds and rain. The Texas Oil and Gas Association, the state’s largest petroleum group, said Thursday that refineries and terminals are still assessing any damage wrought by the storm and working with government officials to find alternative routes to minimize disruptions to supplies. “The fuel distribution system in Texas and across the nation is very large and individual companies are directing all resources to safely re-engage the necessary infrastructure to work through the challenging circumstances,” said Todd Staples, the association’s president. Meanwhile in Corpus Christi, as Vice President Mike Pence, Gov. Greg Abbott and other federal officials surveyed damage from Hurricane Harvey, U.S. Transportation Secretary Elaine Chao told reporters that she has signed an order — at the request of Abbott — expediting the transport of fuel from other states to Texas. "We need it," Abbott added. Cassi Pollock contributed to this report. Disclosure: The Texas Oil and Gas Association has been a financial supporter of The Texas Tribune. A complete list of Tribune donors and sponsors can be viewed here.